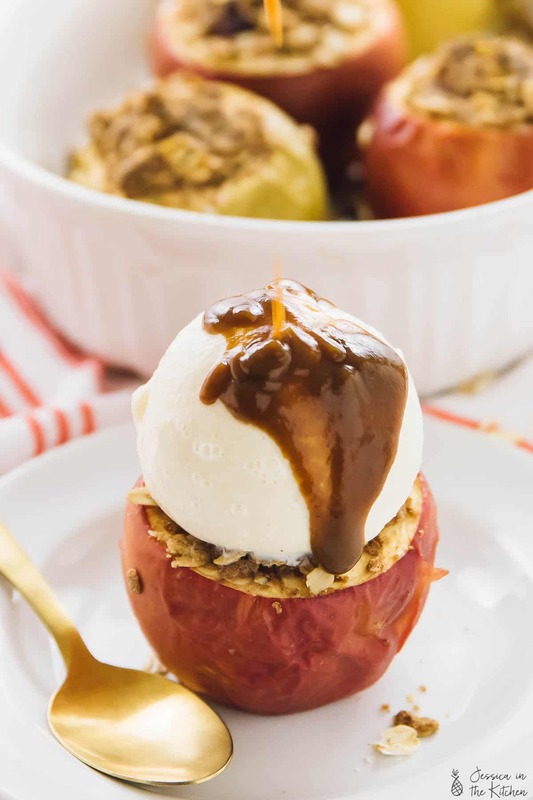 These Baked Apples are perfect for fall and anytime you want a delicious and easy dessert! 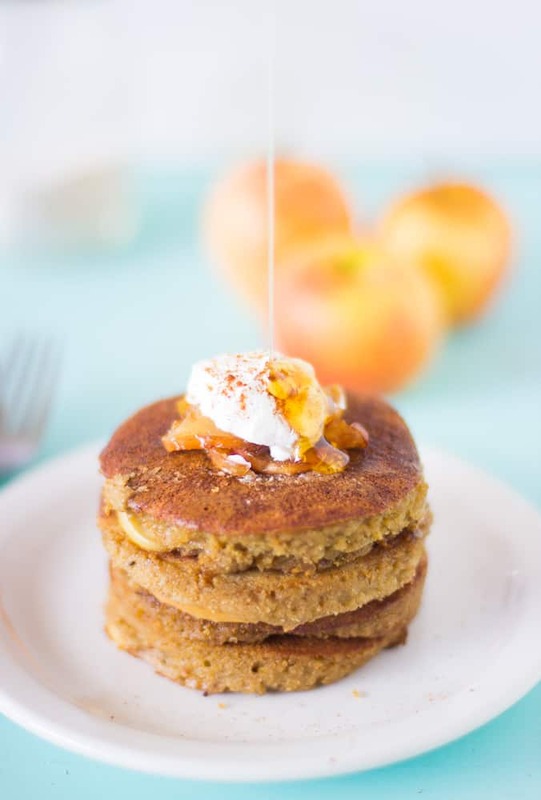 It’s stuffed with a warm, crunchy yet soft cinnamon oat crisp! I’ve never had baked apples before making these. I’ve always heard of them, seen them, and marvelled at them. Of course, baked apples into chips and baked pears but never baked apples. That’s of course all changed now. 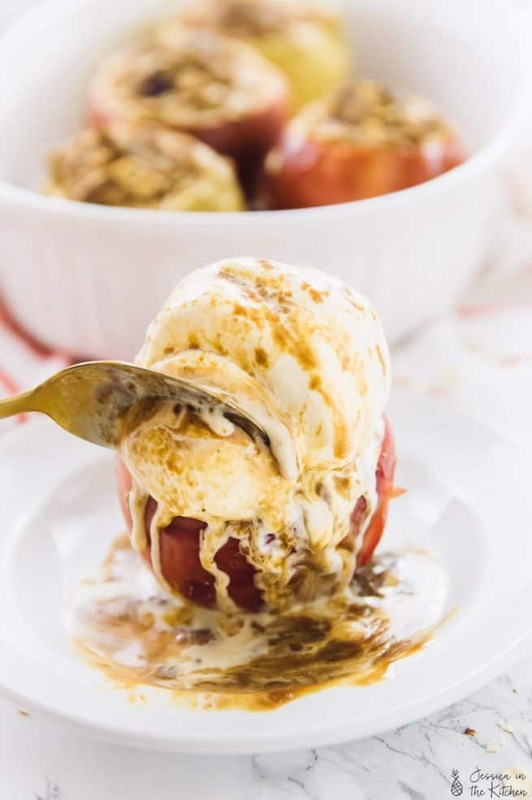 One bite into these warm, welcoming apples loaded with melty ice cream on top and warm caramel sauce pouring down let me know exactly what I had been missing. I’m 100% welcoming fall in with open hands with these babies. Am I the only that gets really excited with the changing seasons? Depending on where you live, you may not see the effects immediately, but I think you can definitely feel it – I always do. I begin to want all things cozy. I find myself online window shopping for sweaters, I want to take more mini vacations. As the year winds down, I find myself wanting to wind down too. More tea, lattes, and warm desserts, please! More move nights in under the blankets, with cozy caramel popcorn and pretty much doing anything that is themed around the seasons. If you’re trying to find a way to welcome fall, or you just want an insanely delicious dessert, these Baked Apples will do it for you. You can see the colour transformation in these pictures from pre-baked to bake, and it’s also reflected in the taste. The apples become moist, soft, juicy and so tender once baked. I used a mix of Gala and Granny Smith apples, but the Granny Smith apples are my absolutely favourite. The tartness paired with the sweet crisp stuffing go perfectly together. Speaking of that crisp. 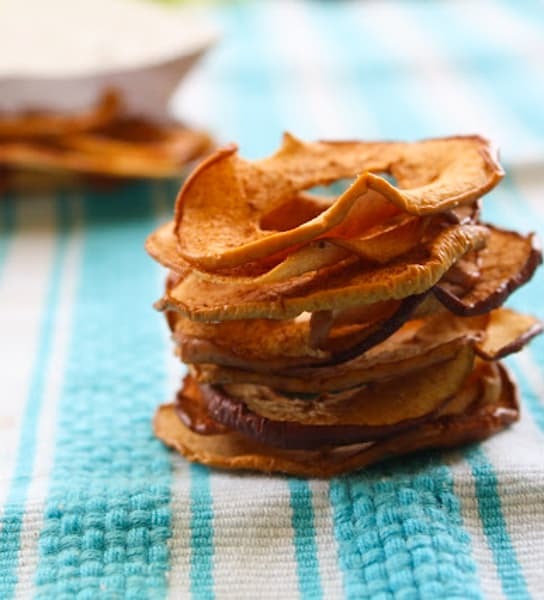 It’s been my go to oat crisp topping for a while, and goes so perfectly with these. Think of it like a quick granola. It remains crisp on the inside yet gets warm at the same time. 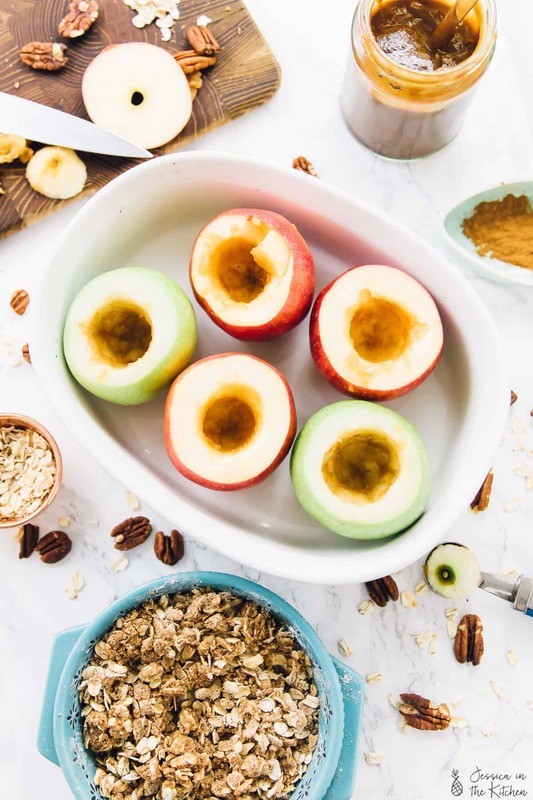 I wouldn’t necessarily call these healthy, but they’re one of the healthiest versions you’ll find of baked apples. I swapped traditional butter for coconut oil, used coconut sugar and of course all other ingredients have been cleaned up. Even when I’m having a dessert, it’s great to know the ingredients themselves are still good for me. It’s the perfect excuse to grab two of these, by the way. 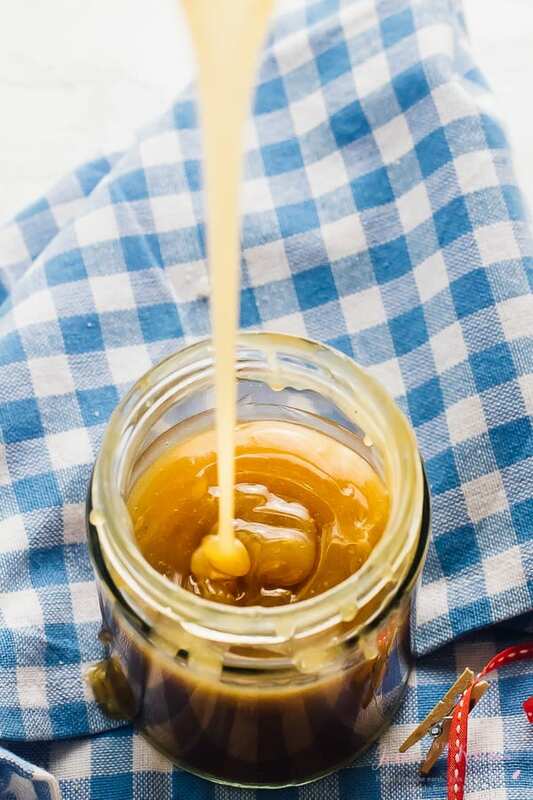 If you want a yummy caramel sauce to use, you can try my vegan caramel sauce. I kind of want to drink it straight from the jar, but somehow seem to manage to resist. It goes SO well with these baked apples. Enjoy, and happy fall when it comes! Preheat oven to 400 degrees F. Prepare the apples by slicing off the very tops, then using a melon baller to scoop out the core, scooping out up to the seeds of the apple (scoop those out too). Set aside in a baking dish upright. Remember not to go right through, since the filling needs something to sit in. Mix the oats, flour, cinnamon, nutmeg, coconut sugar and salt. If using the pecans, you can stir them in now. Once combined, stir in the coconut oil until it becomes a crumble/crisp texture. You can use a fork or your hands to combine. You want it moist, not too crumbly, so you can pack it together between your fingers. Add the stuffing to the centre of the apples, packing tightly and leaving some on top too. If using pecans, ensure none of them are exposed on top else they'll burn. Bake for 35 minutes in the oven. Remove from oven and test the softness of the apple - you want the outside to be soft and wrinkled, and the inside soft yet still crisp. You can bake for an extra 5 minutes if you want them even softer. The apples will be very hot. Remove carefully and top with ice cream and homemade vegan caramel sauce, if desired. Enjoy! 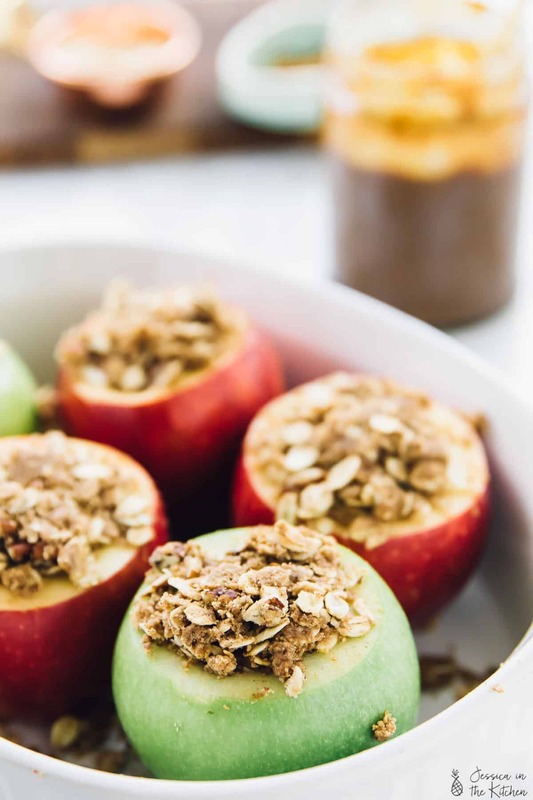 If you try this Baked Apples Stuffed with Cinnamon Oat Crisp please let me know in the comment section below, or tag me on instagram with the hashtag #jessicainthekitchen! For more exclusive recipes follow me on Instagram AND on Snapchat: jessinkitchen. 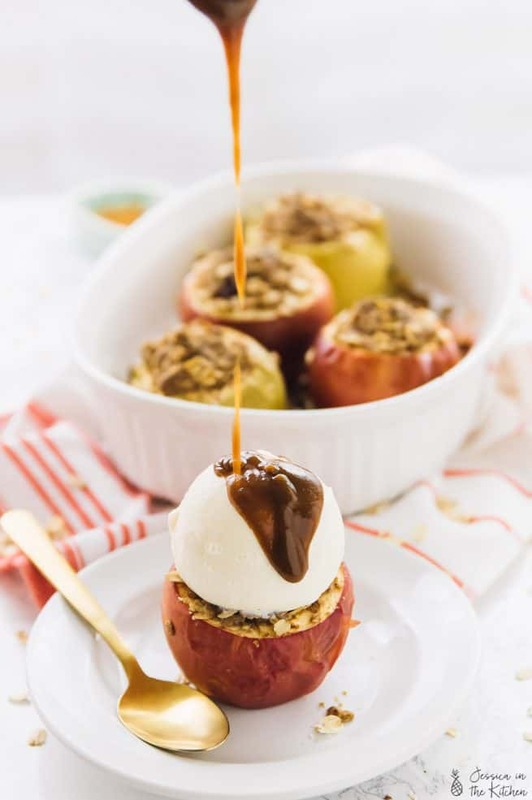 Have never tried or made baked stuffed apples…these look so inviting with ice ream atop! What a great take on apple crisp and your photos are beautiful!